Do Not Feed the Black Bears! I had a client call me to report their first black bear sighting at Deep Creek Lake over Memorial Day weekend. The black bears have awaken from their slumber and are roaming around looking for ‘fast food’. Their main targets are trash cans and dumpsters. I can’t tell you how many times I have driven by Marsh Hill Rd or Rock Lodge and saw a bear on its hind legs digging into the trash. A past employee at Garrett 8 Cinemas told me that just about every night, the bears going dumpster diving there when they forget to close the lid. 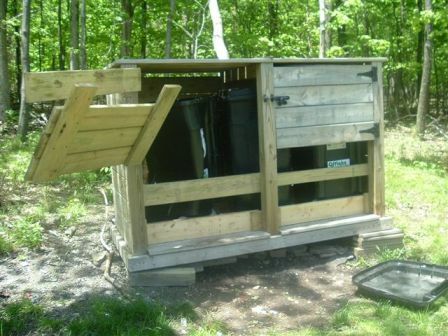 I had shown some photos of what a black bear can do to a ‘bear-proof trash container in a previous post. Watch from a distance and don’t get in the way. 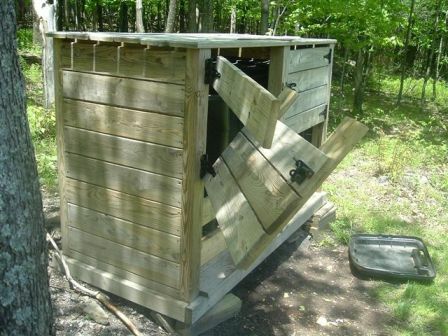 Bear attacks are very rare, but use common sense – DON’T FEED THE BEARS. 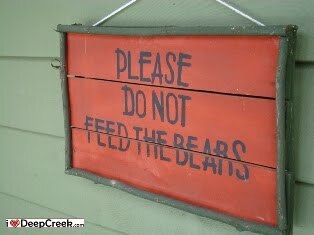 Posted on May 31, 2010 Author adminCategories black bears, deep creek lakeLeave a comment on Do Not Feed the Black Bears! CUMBERLAND — Maryland customers of Greensburg, Pa.-based Allegheny Energy Inc. will see changes after the company’s pending merger with Ohio-based FirstEnergy Corp., but they stand to be small ones, at least in the first few years. The companies submitted an application Thursday to the Maryland Public Service Commission for authorization of the merger. They first announced their $4.7 billion merger agreement in February. The combined company will be based in Akron at FirstEnergy’s current headquarters. But it will operate a regional headquarters somewhere in its Western Maryland service area, according to Allegheny Energy spokesman David Neurohr. The planned location of that headquarters hasn’t been released. Maryland customers will receive a credit of about 50 cents per month on their energy bills over the two years following the merger. The credit will go to residential customers and will appear as a line item on each monthly statement, Neurohr said. For the company, that will add up to about $2.5 million over the two-year period. It’s a step taken to demonstrate to the PSC that the merger will provide a concrete benefit to ratepayers, he explained. In the application, FirstEnergy also included a guarantee that none of Allegheny Energy’s utility workers will be laid off as a result of the merger. That guarantee extends for two years after the merger is finalized. Allegheny Energy employs about 380 people in Maryland, and about 4,400 overall. The provision applies to the “physical work force,” Neurohr said — employees who maintain the wires and rights of way and handle other utility maintenance. It does not include office or executive staff. FirstEnergy has committed to maintaining the same levels of community development and charitable donations as Allegheny Energy currently contributes in its service area for three years after closing the merger. After that, FirstEnergy will contribute an amount described as consistent with its donations in the company’s other service areas. Neurohr said the PSC is required by law to provide a decision on the merger within 180 days, but has the ability to extend that period by another 45 days. In the meantime, the merger must also be approved by the Federal Energy Regulatory Commission and regulatory agencies in Pennsylvania, West Virginia and Virginia, states also served by Allegheny Energy. Applications have been filed in each of those states, except in Virginia, where the companies plan to submit an application in the near future. If authorized, the merger is set to close in the first half of 2011. Take some time today to reflect on all of the freedoms and blessings we have in our lives – and remember those who died to make sure that their sons and daughters could enjoy these liberties. By 1865 the practice of decorating soldiers’ graves had become widespread in the North. General John Logan, National Commander of the Grand Army of the Republic–the society of Union Army veterans–called for all GAR posts to celebrate a “Decoration Day” on May 30, 1868. There were events in 183 cemeteries in 27 states in 1868, and 336 in 1869. The northern states quickly adopted the holiday; Michigan made “Decoration Day” an official state holiday in 1871 and by 1890 every northern state followed suit. The ceremonies were sponsored by the Women’s Relief Corps, with 100,000 members. By 1870, the remains of nearly 300,000 Union dead had been buried in 73 national cemeteries, located mostly in the South, near the battlefields. The most famous are the Gettysburg National Cemetery in Pennsylvania and the Arlington National Cemetery, near Washington. The Memorial Day speech became an occasion for veterans, politicians and ministers to commemorate the war–and at first to rehearse the atrocities of the enemy. They mixed religion and celebratory nationalism and provided a means for the people to make sense of their history in terms of sacrifice for a better nation, one closer to God. People of all religious beliefs joined together, and the point was often made that the Germans and Irish soldiers had become true Americans in the “baptism of blood” on the battlefield. By the end of the 1870s the rancor was gone and the speeches praised the brave soldiers both Blue and Gray. By the 1950s, the theme was American exceptionalism and duty to uphold freedom in the world. The first known observance was in Waterloo, New York on May 5, 1866, and each year thereafter. The friendship between General John Murray, a distinguished citizen of Waterloo, and General John A. Logan, who helped bring attention to the event nationwide, was likely a factor in the holiday’s growth. On May 5, 1868, in his capacity as commander-in-chief of the Grand Army of the Republic, a veterans’ organization, Logan issued a proclamation that “Decoration Day” be observed nationwide. It was observed for the first time on May 30 of the same year; the date was chosen because it was not the anniversary of a battle. The tombs of fallen Union soldiers were decorated in remembrance. African Americans had their own separate Memorial Days, beginning with a major celebration on May 1, 1865 in Charleston, South Carolina. It was the nation’s first Memorial Day. Beginning in 1866 the Southern states had their own Memorial Day, ranging from April 26 to mid June. The birthday of Confederate President Jefferson Davis, June 3, became a state holiday in 10 states by 1916. Across the South associations were founded after the War Between the States to establish and care for permanent cemeteries for Confederate soldiers, organize commemorative ceremonies, and sponsor impressive monuments as a permanent way of remembering the Confederate tradition. Women provided the leadership in these associations, paving the way to establish themselves as capable of public leadership. The earliest Confederate Memorial Day celebrations were simple, sober occasions for veterans and their families to honor the day and attend to local cemeteries. Around 1890, there was a shift from this consolatory emphasis on honoring specific soldiers to public commemoration of the Confederate “Lost Cause.” Changes in the ceremony’s hymns and speeches reflect an evolution of the ritual into a symbol of cultural renewal and conservatism in the South. By 1913, however, the theme of American nationalism shared equal time with the Lost Cause. The ceremonies and Memorial Day address at Gettysburg National Park were nationally famous, starting in 1868. However not until 1913, was a Southerner asked to give the main address. In July 1913, veterans of the United States and Confederate armies gathered in Gettysburg to commemorate the fifty-year anniversary of the Civil War’s bloodiest and most famous battle. The four-day “Blue-Gray Reunion” featured parades, reenactments, and speeches from a host of dignitaries, including President Woodrow Wilson, the first Southerner in the White House since the War. Congressman James Heflin of Alabama was given the honor of the main address. He was a famous orator; two of his best-known speeches were an endorsement of the Lincoln Memorial and his call to make Mother’s Day a holiday, but his choice as Memorial Day speaker was met with criticism. He was opposed for his racism. But his speech was moderate, stressing national unity and goodwill, and the newspapers, including those who opposed his invitation to speak, praised him. In Columbus, Mississippi at its Decoration Day on April 25, 1866, commemorated both the Union and Confederate casualties buried in its cemetery. The large cities paid much less attention; their populations did not much remember the Civil War since they grew primarily from European immigration after 1865. Memorial Day was a observed primarily by the the towns and small cities of the North as a sacred day when the war dead are mourned, the spirit of redemptive sacrifice is extolled and pledges to American ideals are renewed. The golden era of Memorial Day was the early 20th century, when aged veterans of the Civil War (who had been born about 1840) paraded through small towns and villages in a day of remembrance. Northern celebrations often included both black and white participants. Memorial Day and other celebratory events attended by black and white veterans frequently pointed to emancipation as a worthy result of the war. By the 1960s the Civil War generation was gone and Memorial Day seemed to be fading, at least in liberal cities. More attention was paid to the Indianapolis auto race, which began in 1895. More people headed to the beaches and parks than to the monuments and cemeteries. Conservatives revived the practice of honoring Memorial Day in the 1980s, under the leadership especially of President Ronald Reagan. The Memorial Day holiday is nearly here, and people everywhere are planning picnics, yard sales, and other activities for the three-day weekend. But more important preparations are under way in the many towns of Garrett County, as well as across the country, as citizens will take this given time to remember the sacrifices made by military personnel. A number of ceremonies, parades, and services are slated this weekend throughout the county, and residents are urged to attend and/or participate. This is the time to remember and reflect, and to consider the freedoms enjoyed now, hard-won by millions of military personnel throughout the country’s history. Photo by John McEwen. Garrett County Roads Department personnel met with the county commissioners on Tuesday and reviewed their bridge, roadwork, and paving projects scheduled for the remainder of Fiscal Year 2010 and upcoming FY 2011. Because of economic conditions, however, that “to-do” list is short. General roads superintendent Jay Moyer said the bid advertisement for construction of a new Swallow Falls Road bridge has been delayed until next year. In the meantime, there is a weight restriction on the bridge, which is located near Swallow Falls State Park. When construction does begin on the new bridge, a temporary one-lane structure with no weight restriction will be placed over the Youghiogheny River. Moyer said it was important to keep the roadway open because of the park and a nearby business that relies on tourism. “The estimated cost of that bridge is going to be in the neighborhood of $3.5 million, of which 80 percent will be federally funded with the county share being 20 percent, or roughly $720,000,” Moyer said. Moyer said the State Highway Administration (SHA) has approved the design contract for the Glendale Road Intersection Improvement Project. Moyer said the cost will be well over $1 million, with approximately $742,000 available in grants. The county’s responsibility will be roughly $258,000. He added that actual construction on the project will not begin until next year. If approved by the Garrett County Fair Board, improvements related to the exhibit hall will begin soon at the fairgrounds, Moyer indicated. County engineer Dwight Emory has proposed a schedule of what needs to happen, how it needs to happen, and how long it should take, the superintendent noted. That work includes a new acceleration/decelera-tion lane, new entrance, a new roadway, two parking areas, and a stormwater system. The estimate cost is $1 million. A $300,000 USDA grant is available, Moyer said, and the county is responsible for the remainder of the cost. He noted that as much “in house” work as possible will be done in order to get the cost down to the county’s budgeted amount. Moyer also reported that replacement of Bridge G-84, located over Mill Run on Chet Kelly Road, has been delayed. The superintendent explained that based on an inspector’s report, the Roads Department was going to use a prefabricated bridge that it already has on hand to replace the current structure. But when Moyer’s staff measured the site in preparation for the replacement, they discovered that the inspector’s numbers were off by two feet. As a result, a new bridge has to be purchased. The estimated project limit is $50,000 in county funds. Moyer said road repairs, including a tar and chip overlay, will be completed on Savage River Road during the 2010 construction season. Estimated at $30,000, the project will be funded by the county. The superintendent noted, as temporary measures, a Grantsville garage crew has put crusher run gravel down and done work to prevent the river from coming onto the road. Moyer said the resurfacing of Chestnut Ridge and New Germany roads is expected to proceed the first week of June. The commissioners awarded the project to Keystone Lime, which submitted a bid of $1,068,236.60. Purchasing agent Brian Bowers noted that the bid was $248,958.75, or 18.9 percent, below the engineer’s estimate. Funding for this project is through the American Recovery and Reinvestment Act of 2009 in the amount of $1,204,000. Driveway “tie-in” work and costs, however, will be the county’s responsibility. Keystone has 30 working days to complete the project. In addition to the major projects list, Moyer presented the commissioners with his four-year improvement plan for various other county roadways. Moyer told the commissioners he would just have to update the commissioners on plan changes, based on funding availability and road conditions. He asked the commissioners to once again consider “banking” half of the paving money for winter operations. Moyer said, hopefully, that money will “still be there” in the spring to use for paving projects. The commissioners earmarked some of the county’s paving money for this past winter’s operations. This was very beneficial to the Roads Department, as the local area received a record amount of snow, more than 260 inches, this past season. The commissioners’ next scheduled public meeting is Tuesday, June 1, beginning at 11 a.m. at the courthouse in Oakland. The 23rd annual McHenry Highland Festival will take place Friday through Sunday, June 4–6. Scheduled to kickoff the festival is a Celtic concert at Wisp Resort Friday evening. A cash bar and light fare will be available at 7 p.m., with the concert slated at 8 p.m. The event will feature world renowned Scottish fiddler Bonnie Rideout, Celtic rock band MacTalla Mór, Celtic singer-songwriter Christina Harrison. The festival will continue Saturday from 9 a.m. to 5 p.m. at the Garrett County Fairgrounds in McHenry. Admission is $12 for adults, $6 for students, and free for children 12 years of age and younger. This year’s honorary clan chieftain is Odette Lueck, who will preside over the festival. Music of the Scottish Moors will soon resound throughout the Deep Creek Lake area, as the 23rd annual McHenry Highland Festival is scheduled for next weekend. The festival features a Celtic concert at Wisp Resort on Friday evening, June 4, a wide variety of activities on Saturday, June 5, at the Garrett County Fairgrounds, and a Kirkin’ o’ the Tartans on Sunday, June 6. See story. Pictured is the Parade of Clans from a few years ago. The parade is scheduled for noon on Saturday at the fairgrounds and will feature clan representatives, military units, Celtic dogs, and, of course, pipe and drum bands. Photo by John McEwen. Be safe, don’t drink & drive, and have a blast this weekend! I’ll see you on the lake! !